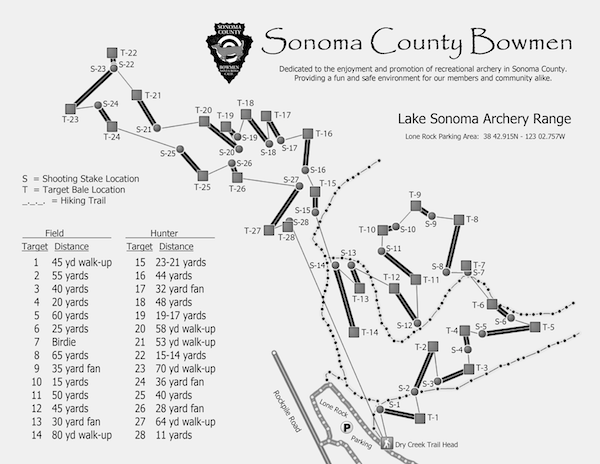 Sonoma County Bowmen is pleased to sponsor the archery range at Lake Sonoma. It is approximately 30 minutes north of Santa Rosa. It is on public land and gates are open from around 7am until 7pm. The terrain is beautiful with trees and hills, but some areas do have moderate inclines or declines. It can also be very warm in the summer. We suggest good outdoor sense – wearing hiking boots and a hat as well as bringing some water to drink. There is no running water however there are picnic tables and portable toilets at the parking lot. Our range is a standard NFAA range with varying shooting distances. An NFAA official inspects our range every two years. Upon successful completion of this safety inspection, we receive a rating and our annual charter. Currently we have 28 targets marked with both field and hunter distances to service the three sections: 1) Field Targets – Have white backgrounds with a black bulls eye and are set at increments of 5 yards; 2) Hunter Targets – Have black backgrounds with a white bulls eye and are set at various odd yardages; and 3) Animal Targets – Paper drawings of various types of animals. A clear trail leads the progression to each target similar to that of a golf course. A sight-in area with targets at various distances is provided to fine tune bows and sights. Currently there is no specially designated area available for broadheads and broadheads are not allowed to be used at the current targets. Target arrows with field points are to be used throughout the range. SCB has signed an agreement with the Army Corp of Engineers to use this land at Lake Sonoma. Please come and check out our range!